ACP™ A.P.F. Aquarium Plant Food™ 1 gal. Helps create a natural and safe fresh water habitat. APF™ helps maintain proper water chemistry, proper pH, favorable aquarium and pond conditions. APF™ supports an esthetically pleasing and natural bio-tope presence in fresh water aquariums and ponds. 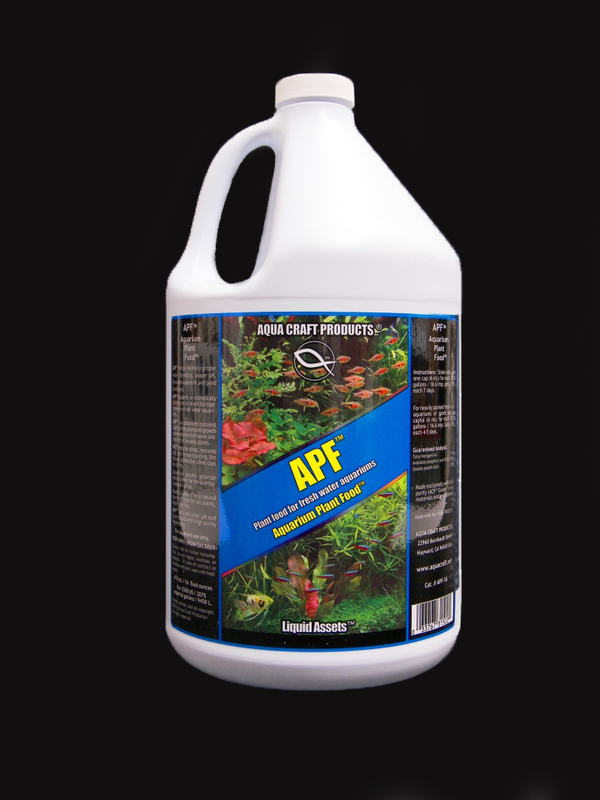 APF™ is a balanced nutrient additive that promotes growth and development of leaves and stems of all aquatic plants. Aquarium plants provide natural shelter for fish to enjoy a natural habitat. APT™ will not alter pH and is produced with USP & ACP™ grade ingredients. Use one cap (6 ml) for each 20 US gallons / 16.6 Imperial gallons / 75 L each 7 days. For heavily planted fresh water aquariums or ponds use one capful (6 ml) for each 20 US gallons / 16.6 Imperial gallons / 75 L each 4-5 days. 16 ounce / 474 ml size for up to 2500 US gallons / 2075 Imperial gallons / 9450 L.
1 gallon size /3.785 L for up to 20,000 US gallons.